Etgar Keret’s work often follows a formula in which a realistic situation and setting turn suddenly surrealistic or fantastic. His new collection, Suddenly a Knock at the Door, is no exception. One of the whimsical stories “Unzipping” is about woman who finds a zipper under her boyfriend’s tongue and decides to unzip it. Beneath the man she is dating, Tziki, she finds Jurgen the German (a seemingly more desirable mate than Tziki), so hides Tziki’s outer casing in the bottom kitchen cupboard behind the trash bags. This surprising shift to surrealism points to a lifestyle informed by the consumer model of disposability, but also suggests an unbearable present from which the characters want to escape. The story ends with the woman finding a zipper underneath her own tongue; she too will probably unzip into an alter-reality. While extremely funny and playful, these stories point to a desire to escape from the reality of everyday life, an insufferable present. “Lieland” begins as a funny tale about a boy who lies too much, but ends with a profound and touching transformation in his approach to lies that results from the alter-reality he finds in the hole in the backyard of his childhood home. As Robbie looks for change to buy his dead mother a gumball, he is kicked and mugged by his first lie– a gap-toothed redheaded boy. The relationships he finds and builds with a blind man, an injured dog etc, cause him to rethink the ways that he uses language. As a result of his encounters he decides to tell positive lies, (where no one gets hurt or gets cancer). He makes a connection with a liar in his firm and by exposing her to the consequences of her lies (the ill uncle etc), she too decides to take an active roll in making the world a more positive place. Together they decide to go and take care of one of their lies, Igor (the blind man with the heart condition). 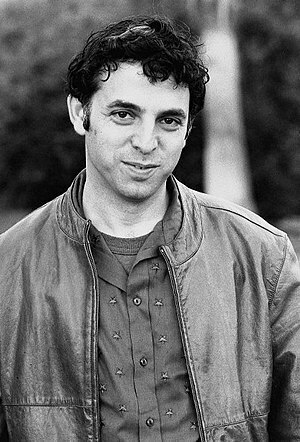 Keret is a master at satirizing the social problems in Israel, while he simultaneously makes serious observations about the dire state of human connection in society. The title story of the collection “Suddenly, A Knock at the Door” centers on a writer in Israel who is forced to write—that is, threatened to do so at gunpoint and knifepoint. As more people knock on the writer’s door, they are added to the story (the one we are reading and the one the writer in the story is telling). Reality provides the fodder or frame for the story. Each additional knock and the seemingly endless repetition of the entrance of yet another violent character speaks to the process of writing in a militarized environment. The writer is the story (Keret) feels obliged to write about reality (the characters that show up at his door) and cannot separate his work from those who enter; perhaps the author’s style and content, too, are born out of the particular environment in which he lives: a country of immigrants, Arabs, normalized carcerality, militarism, an exhausted reality, and cycles that seem to endlessly repeat themselves.